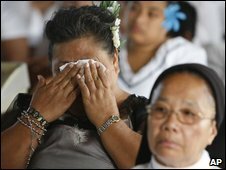 Phil Mercer: "This has been an extraordinarily difficult period"
People in Samoa and neighbouring Pacific islands have packed churches and community halls to remember those killed in last week's tsunami. The BBC's Phil Mercer, in the capital Apia, says the services are a vital part of the islands' healing process. However, he says it remains to be seen whether displaced residents will want to return to low-lying areas. 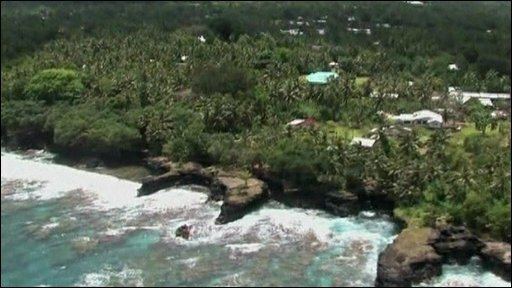 More than 170 people died when the tsunami - triggered by an earthquake - hit Samoa, American Samoa and Tonga. It has been a day of deep sadness and reflection as the South Pacific remembers victims of the tsunami. Here in Samoa, church services have provided some comfort to families burdened by the weight of so much grief. One clergyman wondered why such brutality had been inflicted on helpless communities. Survivors have insisted that their faith had been strengthened, not diminished, by the dark seismic forces that claimed so many lives and caused immense devastation. A national day of mourning is expected to take place in Samoa later in the week. Samoan Prime Minister Tuila'epe Sailele Malielegaoi joined the congregation at Apia's main Methodist church to remember the many lives that were lost in the tsunami more than five days ago. Along with bereaved families, there were diplomats as well as foreign medical staff. At the Congregational Christian Church of Lalomanu, representatives of 10 families mourned 52 lost relatives. In the Immaculate Conception of Mary Cathedral in Apia, Monsignor Ioane Vito urged the congregation to unite to overcome the disaster: "Don't dwell on it but rebuild our lives together as a community," he said. Similar services were held across this deeply Christian country and over the water in American Somoa and Tonga, our correspondent says. "The council of churches thought it might be prudent and also useful in this tragic time to come together as one big family to pray for the families of the victims and for the souls of those who have passed on, Perina, a church official, told the BBC. "But most importantly it is for those who are left behind with this tragic loss," she added. Government minister Fiana Naomi said on Saturday that she expected about half of Samoa's victims to be buried in mass graves of up to 20 in a new cemetery in Apia. A memorial service would be held in a nearby sports stadium prior to the burials, she added. The tsunami struck following an 8.3-magnitude earthquake at 1748 GMT on Tuesday some 190km (120 miles) from Apia. Villages were destroyed, homes flattened and cars lodged in treetops. Our correspondent says Samoans have reacted swiftly to the disaster and many have begun rebuilding their homes, but others have remained on high ground, afraid to return to the coast. Australia has sent medical and search personnel to Samoa, and a New Zealand plane arrived on Saturday. The earthquake and resulting tsunami left 135 dead and eight missing in Samoa, 32 dead in American Samoa and nine dead in Tonga.